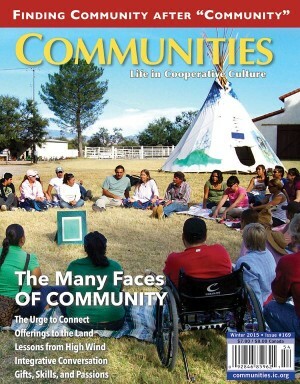 Our latest Communities issue on The Many Faces of Community is proving to be very popular. If you haven’t seen it yet, get a copy by subscribing or ordering a sample now! 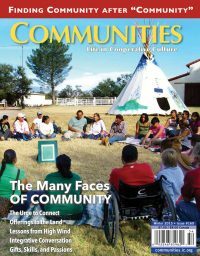 Community can take many forms other than “intentional.” In our Winter issue, veterans of the High Wind Association network and others share their experiences exploring and cultivating community both within and outside of intentional community settings—from refugee camps and inner city schools to small towns and rural ecovillages. Local food, space colonization, compassionate communication, and a host of other topics find their way into these pages as well. Please join us! Myriad groups and connections on “the outside” don’t call themselves intentional—but sometimes are. Togetherness and solitude, action and reflection—our lives give us times for each. The FIC’s new Executive Director reflects on his and the organization’s converging paths. Shop online for lower shipping rates and more shipping options. Print Subscriptions (include digital access): one year, 4 issues: $25 US | $35 Canada and all other countries. Since 1972, Communities has been the primary resource for information, issues, and ideas about intentional communities in North America – from urban co-ops to cohousing groups to ecovillages to rural communes. Communities now also focuses on creating and enhancing community in the workplace, in nonprofit or activist organizations, and in neighborhoods, with enhanced coverage of international communities as well. We explore the joys and challenges of cooperation in its many dimensions. Please subscribe today! If you’re already a subscriber, tell your friends about us, or better yet give a gift subscription. features a selection of articles from our quarterly magazine online. We post a handful of articles from each issue so you can get a taste of what Communities offers.